A man demonstrating a method of holding a cow's head, presumably whilst being milked by the woman visible crouching beside it. He is holding the cow by a horn and by its nasal septum. The photograph was probably taken in 1935 at Yakwach. Manual Catalogues [index taken from album book IX, ms ink] - 4. 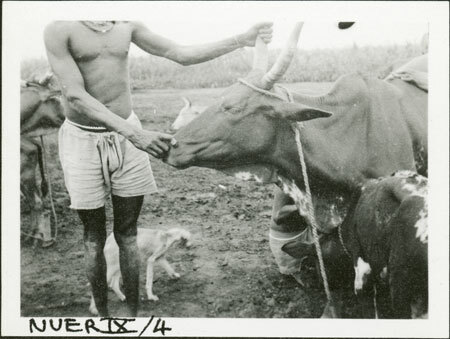 Method of holding cow. Note on print reverse ms pencil - "43 1 A64" & print front border ms ink - "NUER IX/4"
Morton, Chris. "Holding Nuer cow" Southern Sudan Project (in development). 03 Jan. 2006. Pitt Rivers Museum. <http://southernsudan.prm.ox.ac.uk/details/1998.355.399.2/>.